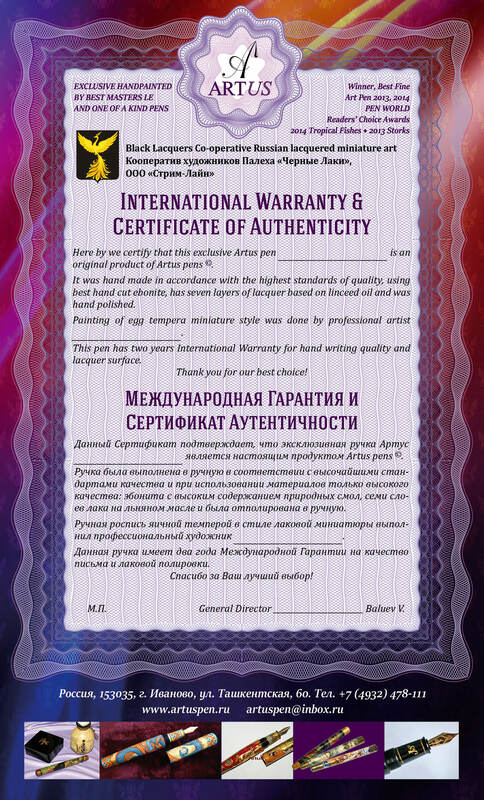 Artus pens received Best Artistic Pen of The Year 2013 Award (Pen World magazine)!!! Artus Tropical Fishes pen was voted as the Best Fine Art pen of the Year 2014! second time in a row! NEWS ! Artus was awarded Best Historical and Cultural Pen of The Year 2018 by the readers of Pen World magazine (one of a kind fountain pen American Eagle and Buffalo)! Breaking NEWS ! We will be participating again in the most important cultural fair of Russia - 45th Russian Fine Art & Antiques Fair, Moscow, Central Painters House from March 5th till March 10th, 2019! Let us know to artuspen@inbox.ru that you would like to join, and please do mention the models or type of pen models you would like to check in person (so we make sure to have them with us, no ANY buying obligations, 100%)) for details!!! Hope to see you soon! We accept all forms of payments including personal cheсkes and PayPal! Two years of International Full Warranty! Join 6000+ followers around the globe of Artus pens on Facebook and Instagram and get free trackable shipping during 2019!